Recently we had the chance to read a copy of The Mountain, My Time on Everest by Ed Viesturs. For those of you who don't know who Ed Viesturs is, he is one of the most renowned American Mountaineers and has an uncanny authority when writing about the worlds tallest peaks. He is the first American to climb all the world's 14 mountains higher than 8,000 meters. Among his 31 Himalayan expeditions, he has made 11 to Mt. Everest, with his first summit coming in 1990, as a part of multinational "peace" expedition of Soviet, Chinese and American climbers. Ed Viestures has reached the summit of Mt. Everest a total of 7 times and was the sixth man to do all 8,000 meter peaks without supplemental oxygen. In The Mountain, Ed Viesturs delivers an exciting first hand account of his own climbs of Mt. Everest as well as detailed narratives of some of the more famous and infamous climbs of Everest throughout the last century, when the honor of nations often hung in the balance, depending on which climbers summited first. In addition to his own experiences, Ed Viesturs sheds light on the fate of Mallory and Irvine, whose 1924 disappearance just 800 feet from the top remains one of mountaineering’s greatest mysteries, and on the tragic last days of Rob Hall and Scott Fischer in 1996, that was written about in Into Thin Air by Jon Krakauer. Ed Viesturs was on Everest during that ill-fated 1996 season and shares his thoughts on the disaster which is one of Everest's most discussed climbing tragedies. Ashley and I have previously read K2 Life and Death on the Worlds Most Dangerous Mountain, by Ed Viesturs and loved that book. 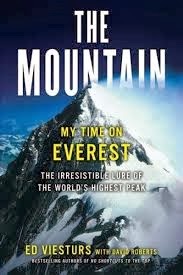 The Mountain, My Time on Everest by Ed Viesturs is a great read. For those that love living vicariously through others that have climbed the worlds tallest mountains or for those that like a good adventure book, this is a must read.